I am not in great shape! I have chafing on my left arm where my armband for my iPhone goes. I alternate using the armband with a bumbag and that has given me stomach chafe. I’m still using the same sports bras I bought 18 months ago on my last visit to Australia and now that I’ve lost a bunch of weight, they move around a lot whilst I’m running so to top it all off, my chest is covered in bandaids! It is time to upgrade some gear! New sports bras, new stick of body glide, new shoes, may be even some new running pants too. It is a good thing the yen is doing well against the Aussie dollar! Today was my last run in Japan until August. It has not stopped raining since I got up at 5:30am and the forecast is for rain all day. 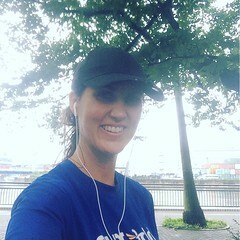 So, I ran in the rain! With the half marathon looming at the end of August, I don’t feel I can miss a single training run. I did an interval run today and I was happy with my splits as I was aiming to keep the 800m intervals under a 5:30 pace and I did. My next run will be an easy 5 km run in Perth tomorrow evening. Hopefully, despite being winter, it won’t be so wet!